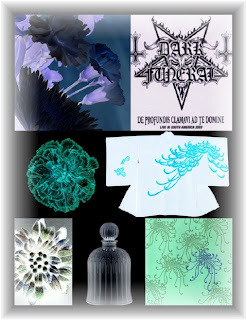 In the summer of 2011, as is customary with the house of Serge Lutens, two new fragrances premiered at the same time, one in the Export line and the other a Paris exclusive, only to be obtained at the Palais Royale du Shiseido by those fortunate enough to have that kind of access. Usually the Exclusive one sounds more interesting than the Export range fragrance, but this time I was not so sure; the one in wide release was Vitriol d’œillet which means “angry carnation,” and knowing the kind of twist that Serge Lutens and Christopher Sheldrake usually put on their perfumes, I was hoping it would be a glorious reincarnation of Caron’s now-reformulated Bellodgia, or perhaps even on the same astral plane as JAR’s fabulous Golconda, which I first tried in its original formula and which I declared to be the best carnation perfume I had ever smelled up until that time. Alas, the “vitriol” part was not a Mommie Dearest style hissy fit but rather a mild annoyance, and while it’s very pretty and even somewhat cozy, it was not the carnation masterpiece I craved. To my nose it is a fairly conventional carnation scent, better than most but not great; in all fairness the bar set by Golconda was very high. Notes include nutmeg, clove, carnation, wallflower, lily, pink pepper, pepper and paprika. I would be happy to own a bottle of this for wearing on cold winter days since I don’t currently own a carnation soliflore, but my preference would still be for DSH Perfumes wonderful Oeillets Rouges, which in the absence of the “real” Bellodgia (and the unattainability of the high-priced and exclusive JAR line) is still my pick for the best modern carnation soliflore around. I thought that the Exclusive line scent sounded more like a weird artsy experiment than a wearable fragrance, but after receiving a sample of it from a generous friend I can say that not only is it a real perfume but a thing of great if unusual beauty. De Profundis is a meditation on death and loss, taking its name from the Latin title often used for Psalm 130 and the line “De profundis clamavi” - “from the depths I cried.” It is based on the idea of funeral flowers, but instead of the lily getting the blame as usual for being associated with death; this time around it is the chrysanthemum taking center stage. (I happen to be an avid grower of both lilies and “mums” and so my own reaction to their smell is generally positive.) It begins with a vivid impression of opening the cooler in a florist shop, sharp and chilly and green, a blast of the exact moment that the odor of an over-chilled bouquet of flowers and filler materials hits your nose as you ponder the rather sad choices available, all of them shivering miserably as they wait for a buyer. If you have smelled the beginning of Carnal Flower (by Fredèric Malle) then you know what I mean by the florist shop vibe, but this is even more intense and more than a little depressing at first. However, it is compelling, and soon the chilliness subsides as the smell of actual flowers begins to develop, and they are indeed chrysanthemums in all their unique herbal pungency, so startling in their realism that it’s hard to believe the room is not full of them. This vegetal aroma is softened by a gentle breath of violets and an anchoring of loamy earth. Once I got used to the idea that this was a perfume without any discernible sweetness except for the hint of violets, I began to enjoy it for its own qualities and soon I even found it addictive. It reminded me a lot of the cemetery next to my childhood home, where the mingled aromas of cut grass, wilting bouquets, freshly turned dirt, wild phlox growing on the older graves and wildflowers, including violets, next to a tree-shaded stone wall greeted me each time I passed through it on my way to exploring the woods beyond. I had no superstitions about graveyards as a child; I always knew it was the living you had to watch out for and that the dead could not harm anyone, so it was a place of refuge for me and I spent many hours there in summertime. I am delighted that there is actually a fragrance that captures this memory so eloquently for me, and I hope it will be released to the export line sooner rather than later. I actually tested De Profundis on a very demanding “focus group” – the members of my local Chrysanthemum club, and they really liked it, one woman so much that I think she may even try to get one of those precious bell jars from Paris. These people are used to being surrounded for hours at a time by the piquant smell of both the leaves and flowers of these plants, so getting a thumbs-up from them is a tribute to its appeal. Vitriol d’œillet is available online at Luckyscent and at better retail shops that carry the Serge Lutens line. De Profundis is in the Exclusive line at the Serge Lutens boutique in the Palais Royale du Shiseido in Paris, France. Image credits: Collage from various sources around the Web – I do not own any of them. Disclosure: My sample of Vitriol d’œillet was a promotional giveaway from Luckyscent. The sample of de Profundis was a gift from a friend. I loved your description of the poor flowers shivering in their cooler more than I can say. What a great visualization. I have a decant of Vitriol but have still to give it a full testing. The other day I had an enormous chrysanthemum in the house and it smelled very heavily of mum. I could see it being a perfume when I smelled that big white ball. The Serge was kind of bland on me. I liked it better than just about any other of his, but felt no great need to buy it. I have a sample of de Profundis on the way, thanks to your wonderful review, thank you! What a wonderful review this was. Your illustrations are inspired! The Vd'O has received such mixed reviews - and many were left underwhelmed by it, but I like it very much. I am coveting the De Profundis like a madwoman and I hope I get to try it! I love playing with imagery and ever since I discovered a collage-making program on my computer I have been having such fun with it! Oeillets Rouges!! I love that one, gorgeous stuff. Must get out my weensy bottle. Thought Vitriol was nice, but merely so, and I haven't tried De Profundis yet (oddly, I find the purple color of the juice depressing).